Wear a blue ribbon pin or blue bracelet every day in April to show your support for Lake County’s children! 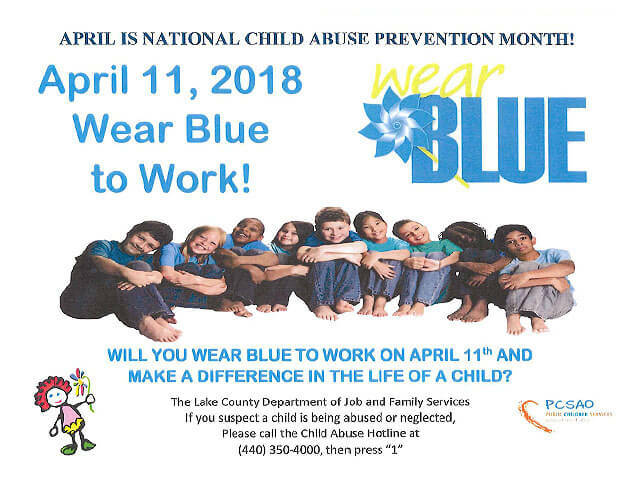 The Lake County Department of Job and Family Services will kick off National Child Abuse Prevention Month with the Pinwheels for Prevention Campaign by displaying 1,100 blue pinwheels at the department. The kickoff ceremony will be held Wednesday, Aprill 11, 2018 at noon at JFS. The pinwheels are a symbol for child abuse prevention and an uplifting reminder of childhood and the bright future all children deserve. For a complete calendar of related area events, please click here.